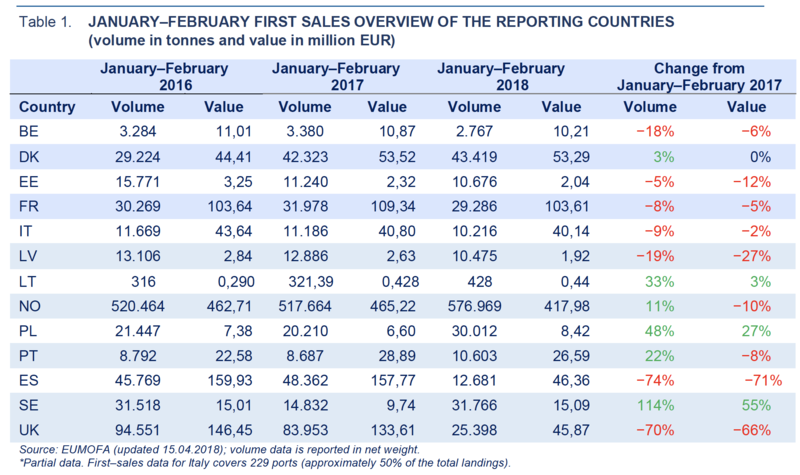 Increases in value and volume: Only Poland, Lithuania and Sweden saw growth in first–sales value and volume. 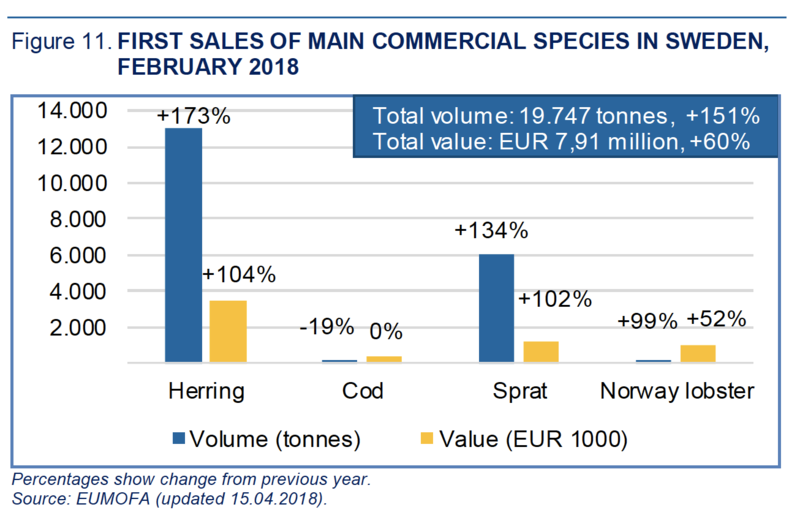 In Lithuania sales grew by 3% in value and 33% in volume, whereas in Sweden, they increased by 55% in value and 114% in volume, due mainly to small pelagics. Decreases in value and volume: First sales dropped in Belgium, Estonia, France, Italy, Latvia, Spain and the UK. The decrease in value and volume was particularly high for Spain (−71% and 74%), Latvia (−27% and −19%), which saw lower first sales of small pelagics, and in the UK (−66% and −70%) due to groundfish and small pelagics as the most important commodity groups in its fisheries. were caused mainly by higher supply of herring, sprat, saithe, haddock, and Norway lobster. The positive trend in volume continued in February 2018. 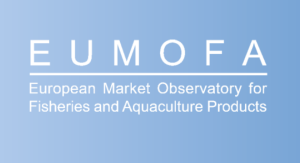 The added supply of top species drove the average prices down by more than 30%, to 0,40 EUR/kg on average. Among the top species, herring had the largest decrease in average price of 26%, to 0,26 EUR/kg. Average first–sales prices of great Atlantic scallop have decreased in Belgium, France, and the UK over the past three years. Average first–sales prices of common edible cockle decreased in Denmark and increased in Portugal and Spain over the same period. On the EU import side, weekly prices of frozen Illex spp. from China more than doubled between 2015 and 2017, nevertheless, in 2018 weekly prices have trended downward. The weekly price of prepared or preserved products of clams, cockles and ark shells from Vietnam fell in early April 2018 but followed an upward trend through the first 15 weeks of 2018. In January 2018, the average retail prices of fresh carp for household consumption in Germany and Poland were 6,93 EUR/kg and 4,42 EUR/kg, respectively. In 2016, EU vessels landed 743.000 tonnes of Atlantic herring, representing about 44% of global herring catches. Almost half of the total seafood consumption in the UK occurs out of home, in particular in fish and chip shops and other quick service restaurants. From January 2019, based on Act on the Management of Marine Resources of the Faroe Islands, the longliners and trawlers catching demersal fish in Faroese waters will no longer be allocated fishing days as on the previous days-at-sea system. This system will be replaced by a quota system.